Alexander Baumgarten, PhD (born in 1972) is Associate Professor at the Faculty of History and Philosophy within the Babeş-Bolyai University, Director of the Centre for Ancient and Medieval Studies and Member of the Editorial Board of the periodical Chora. He is the author of numerous studies in the field of medieval philosophy and also one of the pioneers who translated from Latin to Romanian many of the fundamental works of Greek (Aristotle, Plotin) and Latin (Liber de causis, Anselm of Canterbury, Thomas Aquinas, Siger of Brabant, William of Ockham, Dietrich of Freiberg) philosophy. Adinel Dinca, PhD (born in 1976) is Researcher at the Romanian Academy (branch of Cluj), specialized in paleography-archivistics and editing of medieval documentary texts. He is Ph.D. in Ecclesiastical History at the universities from Cluj and Tübingen; specialized in the medieval paleography, University of Vienna (2002-2004), Erlangen (2011). Research interests : the history of writing and of books in the Medieval Transylvania. 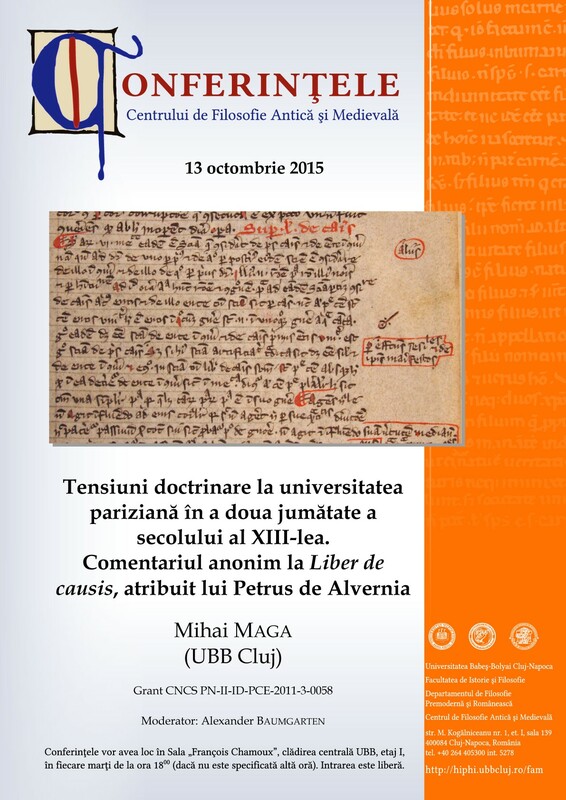 Mihai Maga, PhD (born in 1978) has a PhD in Philosophy since 2006 with a thesis on The Political Philosophy of Marsilius of Padua; he has translated into Romanian Boethius of Dacia, On the Life of the Philosopher (Polirom 2005) and Marsilius of Padua, Defensor pacis (in preparation, Univers enciclopedic 2012). He published several scientific articles in the field of Medieval Philosophy. Alexandra Baneu (born in 1989) is a Student within the Master’s program in Ancient and Medieval Philosophy. She is licensed in philosophy with a final paper on the philosophy of Plato: The Mediatory Function of the Name in Plato’s Philosophy. She is also a last year Student at the Faculty of Letters, within the Department of Classical Philology (Latin–Ancient Greek). Iulia Székely (born in 1987) is a Second Year Philosophy Student at the Faculty of History and Philosophy within the Babeş-Bolyai University. She has a degree in Philology, after graduating the Faculty of Letters of the same University in 2010 with a double specialization (Major: Romanian and Minor: English) with a final paper on American literature: An Overview on the Beat Generation — An insight in Kerouac’s On the Road.